va-Q-tec is expanding its global footprint in Asia-Pacific (APAC). With subsidiaries already in South Korea and Japan, the new entity in Singapore is the next step in va-Q-tec’s global expansion in Asia. The goal is to increase commitment in the APAC region and answer to the demand for high performance solutions and products in the temperature controlled supply chain industry. To implement temperature-sensitive logistics chains, va-Q-tec operates a fleet of globally available rental containers and boxes meeting demanding thermal protection standards under the “TempChain” umbrella. Singapore and the whole region with its hot and humid weather conditions is one of the most challenging temperature environments for TempChain transportation on the globe. 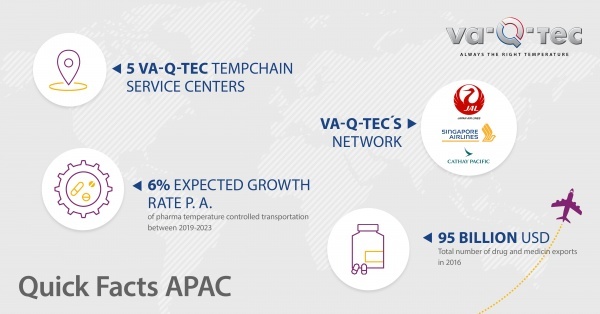 By opening a site and a TempChain Service center in Singapore, va-Q-tec broadens its TempChain Service Network and product offering in the region, together with local partners such as Singapore Airlines, Japan Airline and Cathay Pacific Airlines. Singapore is a central logistics hub with modern airport and infrastructure facilities for Southeast Asia. On top of that, it is one of the most open economies in the world and EU’s most important trading partner in the region. This opens up opportunities to attract new customers and partners for va-Q-tec. More than 30 of the world’s leading pharmaceutical technology firms have built up offices and manufacturing plants in Singapore. For the pharma market that requires temperature controlled transportation, projections show that the CAGR between 2019 and 2023 exceeds 6 % p.a. Tightening temperature control regulation in pharmaceutical value chains drives this secular trend.